When my middle daughter was little she used to mispronounce the word, remember, as mender. I loved it for all the reasons a parent finds their child's quirky takes on things endearing. I still occasionally turn to her and ask, "Mender when...?" Well, in that spirit, mender when I said I was going to make a skirt just like these, but in my own fabrics? You mender that? Well, I did, kinda, sorta. As promised, I did make the skirt using the same pattern with the same modifications and the skirt is made out of my fabric. But, not in my a stitch in color fabric. Rather I used some of my hand dyed and patterned fabric in a new print, Fields. I haven't decided if I'm going to reproduce it in my usual palette or even if I want to add this pattern to my store. I was just playing and making fabric with really no endpoint in mind. Initially, I thought I'd use the fabric to make a bag, but then I mendered my promise to make a skirt out of my own fabric and a project was born. In the end I did include a little bit of fabric from my a stitch in color collection. 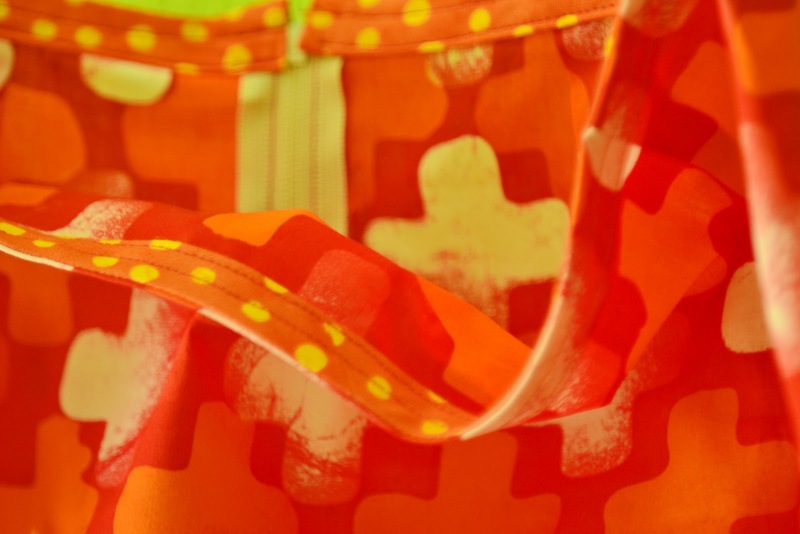 I made the waistband facing in the Pebbles fabric in yellow and orange. No one will see that cute, little addition, but I'll stop every once in a while and mender it's there. those mispronounced words are so dear. my little boy used to call strawberries, 'o-boys'. they will probably be forever o-boys in our house. i have been wondering what pattern you use or is it in your head? LOVE the skirts!@! Ooh love the fabric - it's a very groovy skirt. Nice skirt! I saw your book and fabrics at Intown Quilters in Atlanta yesterday. I love your line! Hey Malka - My girls said "yo-gwit" for yogurt, among other cute things. Sniff, sniff. Love the skirt. 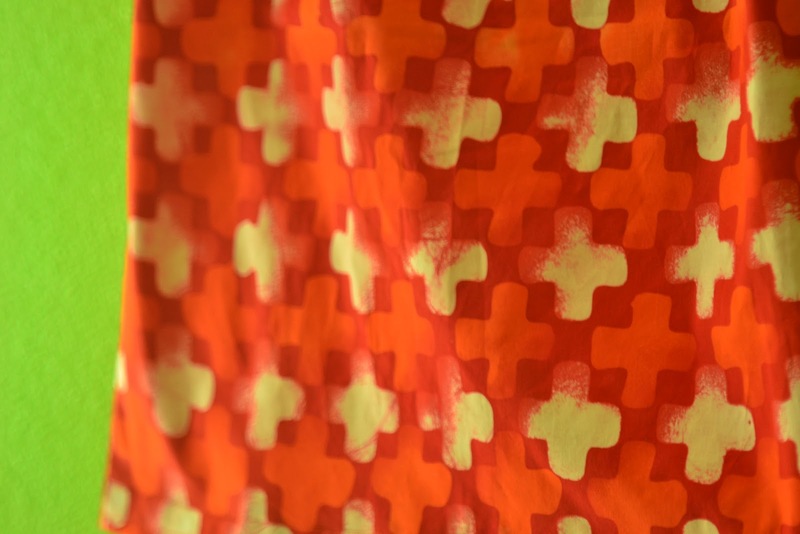 How do you keep your hand dyed fabrics in reds and oranges from bleeding the wash? I have used Synthrapol on other brights, but never have tried washing a really red red out of fear! 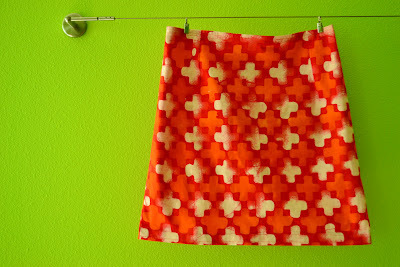 What a great skirt - love the new fabric! Hey sweetie! You have a very beautiful blog with a lot of inspiring posts! I am your newest follower:) If you want, you can follow me back, I'd be very happy! Oh yes. I mender. My son gave us the words "scoop over" for scoot over and "stam up" for stand up. He's 30 now and we all still say those phrases. Love your skirt! I have two charm packs of your A Stitch in Color line and some charms packs of your hand dyed fabric and I'm just about, almost, ready to cut into them. What a lovely story about your daughter. A precious memory.